What are mug match holders? Match holder mugs or steins primarily date from the 1890s to the 1920s and are near exact replicas of standard size mugs in a smaller scale. They generally measure between 2 3/8" and 2 1/2" tall with the majority measuring 2 1/4". What differentiates a mini mug match holder from simply being a miniature mug is the presence of a circular pattern found on its base which acts as a striker. It is not uncommon to find mini mugs listed as toothpick holders. A smaller number of mini mugs can be found with an attached hinged-pewter lid, or (fewer still) with an attached tray. Mini mugs are generally made of ceramic ( e.g. pottery, porcelain, or glass). Many were made in Germany as blanks and sent to various factories where a printed label was applied and then fired in a kiln which fixated the glaze colors on the ceramic surface. Some of the manufacturers known to have produced minis include Thuemler, Villeroy & Boch, Arthur Schiller & Co., Meriden, Connecticut Decorating Works, Homer Laughlin, Bauer, Lenox, and Uhl. Many mini mugs were given away as souvenirs or sold as promotional keepsakes. Some, such as those produced by Villeroy & Boch do not have a striker, but have a manufacturer's mark and the words "Made in Germany" instead. Since match striker mugs do not have a manufacturer's mark, determining who produced them is difficult. 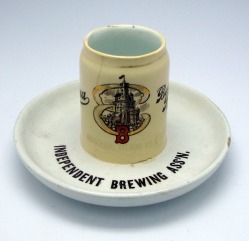 Although there is an abundance of modern mini mugs found in varying shapes and sizes, vintage advertising mug or stein match holders infrequently come up for sale and are quite rare. This makes building a collection a test of patience. 'Stein Match Holder' with prices from the C.F. 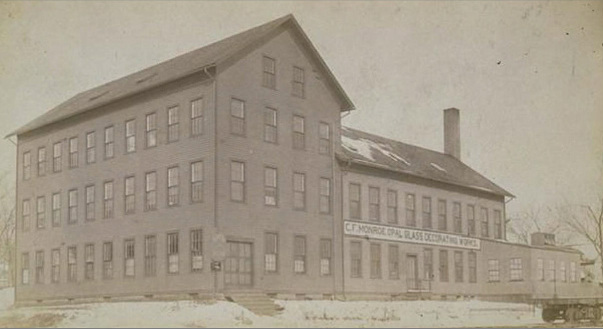 Monroe Opal Glass Decorating Works in Meriden, CT.
Hugo Thuemler operated out of Rochester from 1898 to 1901. From 1901 to 1908, the Pittsburg mark was used on his wares. Villeroy & Boch steins technically may not be considered match holders since no striker is present.